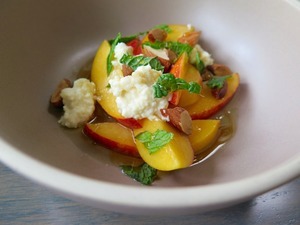 One of the tasty brunch dishes you will find at West Coast Wine. Photo: © tablehopper.com. The 11th annual Pinot Days wine tasting is coming up on Saturday June 20th at City View at Metreon. The tasting offers pours from more than 80 pinot producers from California, Oregon, and internationally. The trade and media tasting is from 11:30am to 1:30pm, and you can register here. Then, the public tasting will be from 2pm to 5pm, with early entry at 1pm also available. Tickets are $75 per person or $100 for early entry. City View at Metreon, 135 4th St. at Howard. As of this last weekend, ~WEST COAST WINE~ in Cow Hollow is now serving brunch on Saturdays and Sundays, 11am-2:30pm. And starting June 15th, they will be open seven days a week: new Monday hours will be 4pm-10pm, with happy hour from 4pm-6pm. It’s also worth noting that on Tuesday June 16th, winemaker Alex Kanzler of Kanzler Vineyards wines will be pouring a flight (including his first-ever release of a Kanzler chardonnay, 2013, the new release 2013 pinot noir, and a barrel sample of the 2014 pinot noir), 6pm-9pm. And mark your calendar, because on Wednesday July 8th, winemaker Curt Schalchlin of Sans Liege Wines will be in the house from 6pm-9pm. 2165 Union St. at Fillmore, 415-376-9720. Truck. 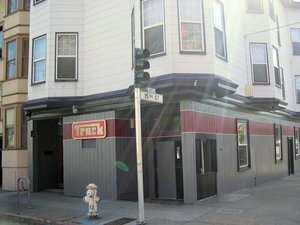 Yelp photo by T. F.
Another gay dive bar bites the dust: according to SFist, scruffy Mission gay bar ~TRUCK~ is closing. Owner Paul Ringhofer-Miller has owned the place for eight years and says he is looking forward to planning events elsewhere, including at the Russian River. The exact closing date is yet to be determined, and there are lots of farewell parties happening this week, so head on down and say goodbye! I know we will all miss being overserved there. As for the new owners, SFist caught the liquor license application for the new owners, and it looks like it will be called Wooden Nickel and the owners are Cassy Fritzen (a bartender at Zeitgeist), Shannon Lynn, and Nancy Chung. We’ll keep you updated on their plans for the place. 1900 Folsom St. at 15th St., 415-252-0306. What do you do when your bar’s name receives a cease and desist order? Why, rename it ~CEASE &AMP; DESIST~, of course. At least, that’s what the team at The Buffalo Club did, according to Capp Street Crap. No word who exactly the order came from, but a quick Google search offer lots of opportunities for speculation. Fortunately, the mirror-ball buffalo head is allowed to stay. 2331 Mission St. at 19th St., 415-906-5571. The former La Movida space on 24th Street has been taken over by the team from Place Pigalle, as previously reported on tablehopper, and now they’ve got a name. It’s going to be called ~BIG REC TAPROOM~ and looks like it will be focused on beer. 3066 24th St. at Treat, 888-477-9288. Beer by Local Brewing Co. Photo from Facebook. 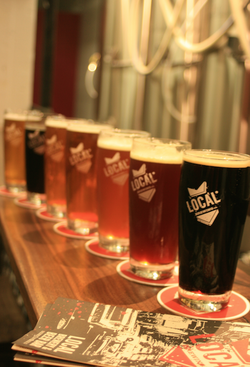 ~LOCAL BREWING CO.~, a new brewery from Regan Long and Sarah Fenson, is now open on Bluxome Street in SoMa. As Lessley Anderson noted in The Chronicle, Local Brewing, which opened last Tuesday, is one of the only breweries in San Francisco where women are brewing the beer. Long and Fenson actually began home brewing more than 10 years ago, and the new brewery is the realization of what had become their obsession. The goal of Local Brewing, they say, is to create a brewery worthy of a special trip, but not so intimidating that only “beer geeks” will be able to enjoy themselves. They’re keeping their production close to the taproom, separated only by a small guardrail, so that people can see where the beer is made and maybe even learn a little bit about brewing during their visit. There are currently 8 beers on tap, but eventually there will be 16 total taps. The current list includes two spins on IPA and an IRA, or India Red Ale, plus the Bluxome Black Lager and SF Lager, a common lager-style beer. They are also serving some simple snacks, like salads and sandwiches, to accompany the beer. Moving forward, they also plan to offer workshops and classes out of their warehouse space. Hours are Tue-Sun 2pm-10pm, closed Mondays. 69 Bluxome St. at 5th St., 415-932-6702.